Staying in Shillong was expensive. We had already decided to move to Dimapur. There were a few buses that could take us from Shillong to Dimapur but we decided to forego them in favour of a more comfortable train journey from Guwahati. For that, we had to leave Shillong early. We bid adieu to Gowri Shankar, took a shared taxi out of Shillong and made our way to Guwahati. Guwahati-Shillong highway is under construction. For most of the part, it is pretty well made. In another five years time, when the entire stretch of the road will be a four lane highway, it will serve as a lifeline for Meghalaya. Even in its current state, it is doing great service to the two states. 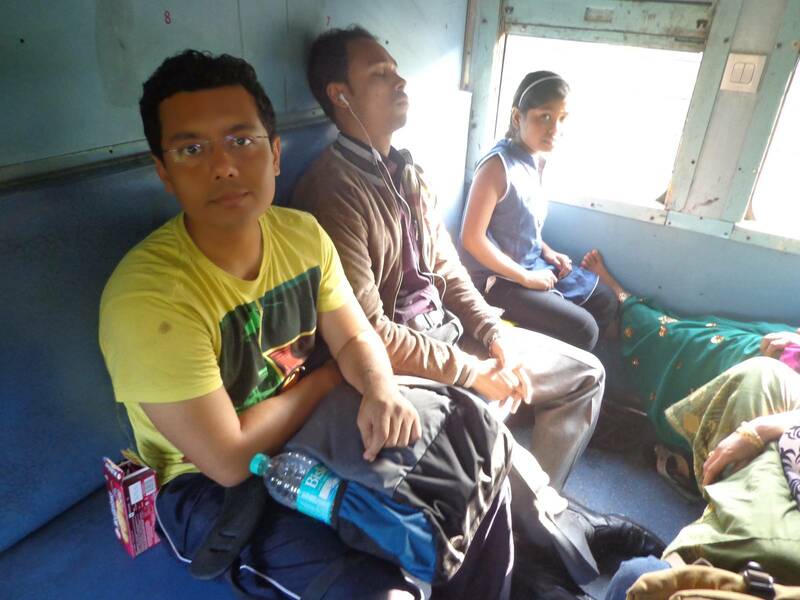 We reached Guwahati at about 2:00 pm and decided to catch the Kamakhya-Dimapur BG Express. The train wasn’t very crowded and we were able to get a seat for the entire 250 km stretch. Nandy with fellow passengers. The small girl was reading an Assamese to English wordlist. The railroad stretch is, for most part, a single line. As a result, the train stopped at many places with multiple tracks to allow other trains to cross. In one such place, just before Lumding Junction, there was a huge JCB loader loading stone chips in an open ceiling goods train wagon. The systematic, rhythmic sound was loud enough to peak my interest in its source. For the last few days, the circumstances were such that we did not have our lunch at noon. Instead, we had a heavy meal in the evening. Today was no exception. We tasted some small snacks from the usual vendors that hawk on moving railway coaches. We also had five rotis and sabji for just 20 rupees at Lumding Junction platform. Nandy pointed out that it was cheaper than a 30 rupees fried rice meal the Russian mentioned earlier about having in Myanmar – one he thought was the cheapest full fledged meal he had ever tasted. It was a good decision to take the train route. 250+ kms of serpentine, hilly roads on a bus comes with some degree of guarantee of motion sickness for people like us, who come from plains. Dimapur is the largest city in Nagaland. It has a large Christian population. The festive mood of Dimapur was visible from the train as we approached the station. 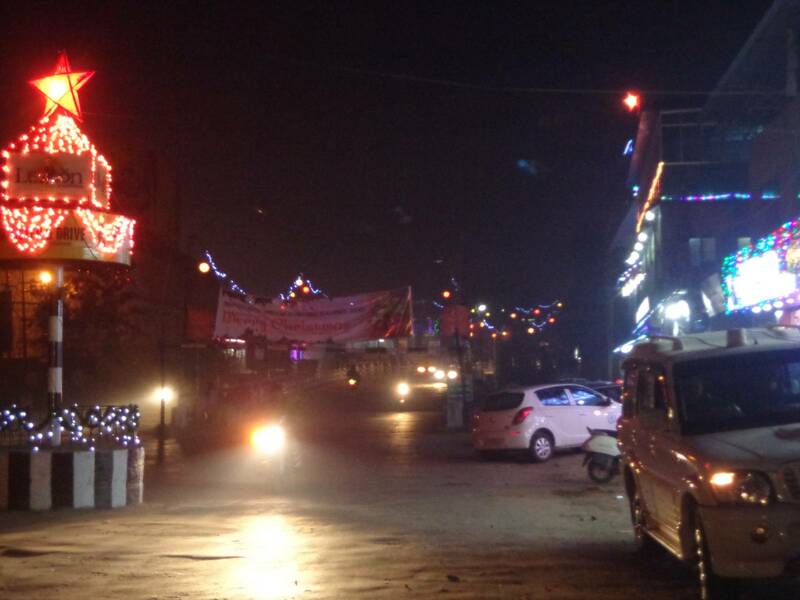 Dimapur has geared up for Christmas. Al the buildings have been decorated with colourful LED bulbs. We had our dinner at a restaurant called Raj Nandini in Naga Shopping Complex near the railway station. The mixed fried rice and the pepper chicken was pretty good. 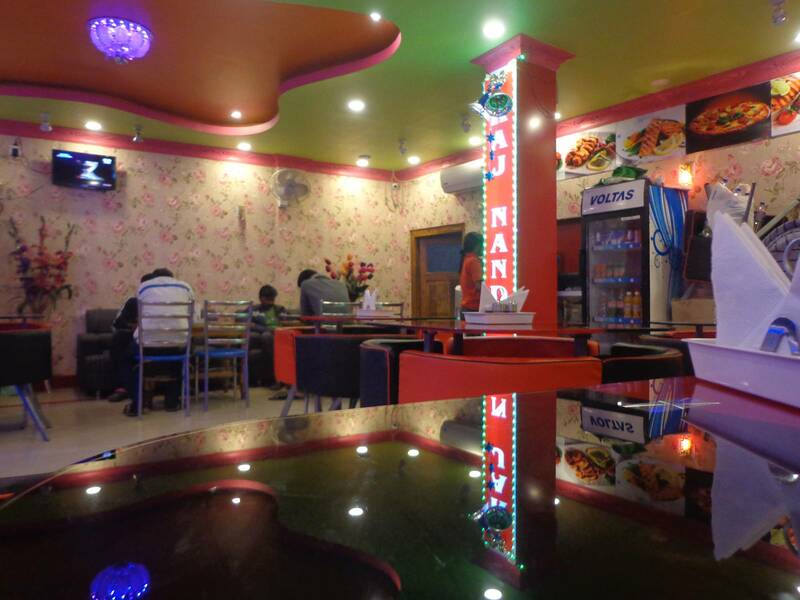 Raj Nandini restaurant at Dimapur. Surprisingly, it is not listed online. 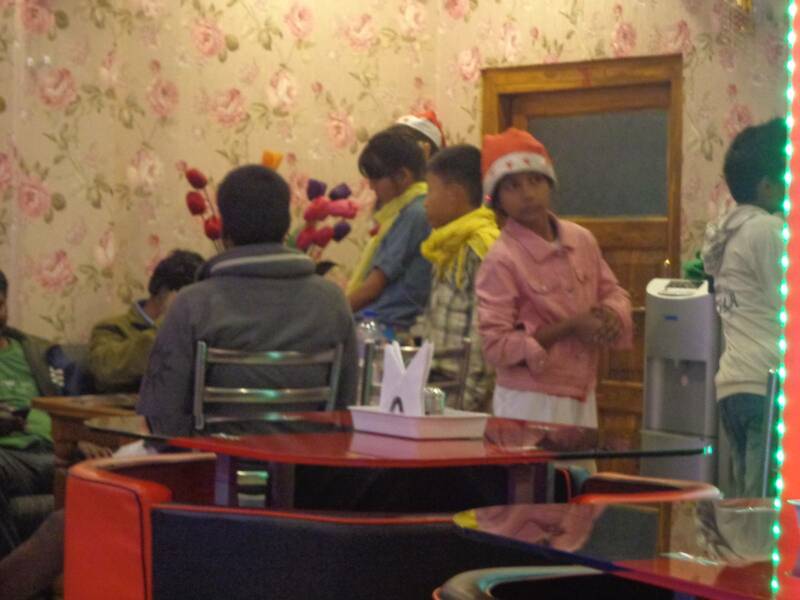 A group of children came in to the restaurant to seek donations for Christmas celebrations. I felt that it was very similar to kids asking donations for Saraswati Puja in Bengal. Kids asking for Christmas donations at the restaurant. 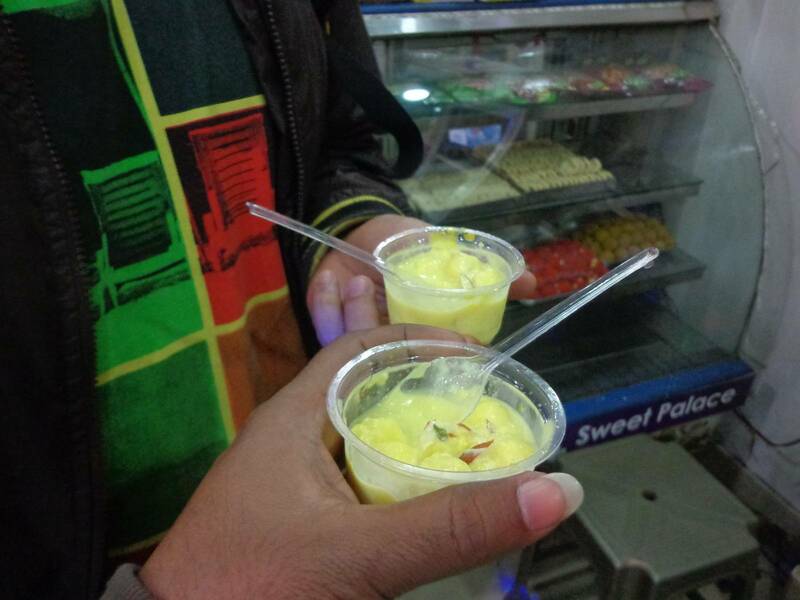 We ended our dinner with some Bengali style Rasmalai in a sweet shop. There are a lot of Bengalis in Dimapur due to the vicinity of Bangadesh and Tripura. In fact, I heard a lot of Bengali locals in the train. On asking our hotel caretaker at Dimapur (who himself was a Bengali), he said that there are a lot of Bengalis who live in Assam, especially away from Guwahati towards the East (Lanka and beyond). Bengali style Rasmalai at Dimapur.